M. Gökhan Aslan graduated from Yeditepe University with BA degree in Business Administration, ranking first in his class. He also earned double major degree (BA) in Psychology, ranking second in his BA class and holds a minor degree in Public Relations and Publicity. After graduation, he worked as assistant coordinator of the TÜBİTAK supported project on “Language Development and Communications Inventory” in 2008/2009 period. He completed training and internship within TV Journalism Training Program organized by Istanbul Bilgi University and NTV. In 2008, he received the High Potential Scholarship from Maastricht University (The Netherlands) during his (taught) master’s studies. In 2010 he presented his master’s thesis, “Conceptualization of Surveillance – Facebook: The Model of Contemporary Surveillance” to Maastricht University and earned his MA degree in (New) Media Culture. 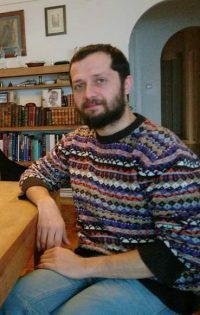 He also graduated from İstanbul Bilgi University with MA degree in Cultural Studies in 2012 with his master’s thesis on “Experience of Anonymity and Social Media Effect.” He joined the editorial board of KÜLT which is a refereed journal on cultural studies, published by İstanbul Bilgi University Press. He prepared and hosted radio programs “İnceden Kültür” and “Akademya” (with co-host Mesut Varlık) on Açık Radyo between 2012-2017. He worked as a research assistant and part-time lecturer in Doğuş University, Department of Psychology. He is a member of European Communication Research and Education Association (ECREA) and Surveillance Studies Network (SSN). Aslan continues his studies as a PhD candidate in Communication at İstanbul Bilgi University. Research interests: Surveillance, anonymity, power in social media, new media theory, political economy of social media, digital labour. Previous İF BİLGİ Araştırma Destek Grubu yenilenen yüzüyle yayında!